DOMA: Supreme Court asks why the House of Representatives was defending DOMA. 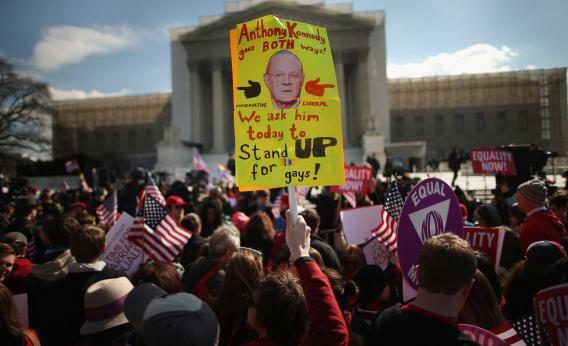 A sign depicting Associate Justice Anthony Kennedy is hoisted during a rally outside the Supreme Court during oral arguments in a case challenging the Defense of Marriage Act (DOMA) March 27, 2013 in Washington, DC. The first big story to come out of United States v. Windsor was the saga of Paul Clement. When the case got to the court, the White House refused to defend the Defense of Marriage Act. The House of Representatives retained Clement to defend the law (via the Bipartisan Legal Advisory Group of the United States House of Representatives), and after an outcry, Clement switched law firms. “Defending unpopular clients is what lawyers do,” said Clement. He was applauded, even if the House Republicans weren’t. And boy, they really weren’t. The House’s odd decision to jump in and defend the law was dealt with over long agonizing minutes in today’s hearings. It was an argument about standing, in part, but it carried a tone of real derision. JUSTICE KENNEDY: We are talking about ex ante, not ex post, what is standing at the outset? And the House says this is constitutional. The House does say that. Last week, John Boehner rejected that the idea that the administration can “decide what’s constitutional” and which laws don’t need defending. Elena Kagan, the newest member of the court, got in a dig at the reasoning that the House (including a younger, less powerful Rep. John Boehner) used to justify the law. JUSTICE KAGAN: Well, is what happened in 1996 – and I’m going to quote from the House Report here – is that “Congress decided to reflect an honor of collective moral judgment and to express moral disapproval of homosexuality.” Is that what happened in 1996? MR. CLEMENT: Does the House Report say that? Of course, the House Report says that. And if that’s enough to invalidate the statute, then you should invalidate the statute. Clement’s point was that the court didn’t tend to rule based on that sort of addendum. But if the White House’s punt was supposed to delegitimize the support for DOMA, it worked.